In my mind’s eye, Japanese culture is like Janus, the Roman god who looks to both the past and the future. 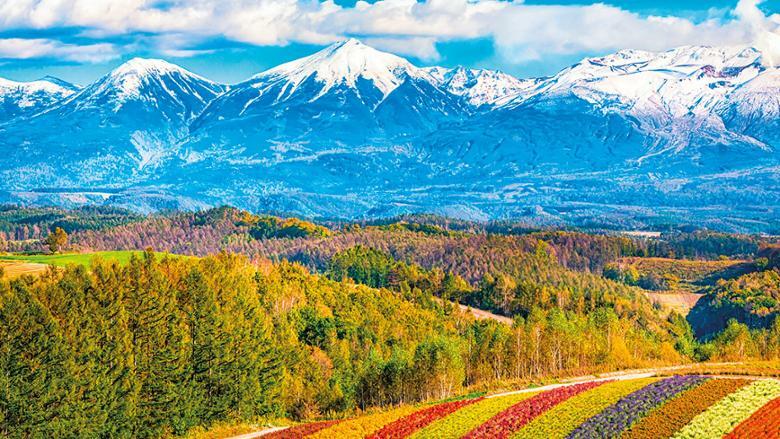 Japan reveres nature, myths and traditional arts, but also leads the world in wacky cartoons, microelectronics and computer game design. These aspects combined in 1991, when The Legend of Zelda: A Link to the Past was released for the Super Nintendo Entertainment System. 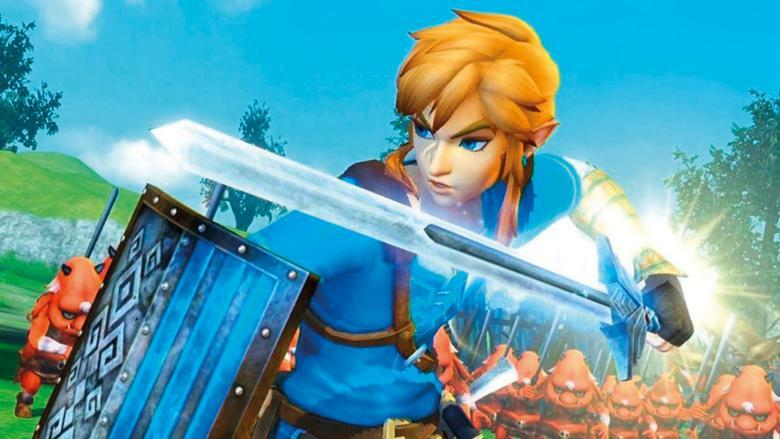 In this adventure — the third instalment in the Zelda series of video games, and rated one of the best games of all time — the player takes control of Link, an unlikely hero who must find the kidnapped Princess Zelda in the magical land of Hyrule. As a teenager, I spent hours exploring the woods, mountains and dungeons of this land, solving puzzles, fighting monsters and meeting random characters. The game’s creator, Shigeru Miyamoto, said that he wanted it to evoke the sense of awe and excitement that he had felt as a child, when he explored the forests and caves near his home on Honshu, Japan’s main island. I’m certain that The Legend of Zelda developed my own sense of curiosity. Since then, I’ve explored woods and mountains across the world, solving my own puzzles and meeting my fair share of characters along the way. But I’ve always wanted to find an earthly Hyrule. A place that evoked that feeling of weirdness and wonder. Miyamoto used the Japanese landscape as the template for his graphics, and drew on Japanese myths for the story. But he did not just translate Honshu into pixels. Honshu is long, thin, and mountainous, whereas Hyrule was square, with forests, marshlands and a single large volcano, Death Mountain. She showed me a small brass cowbell, attached to her pack. It jingled as she walked. ‘And this, just in case.’ From a holster, she pulled out some pepper spray. Lacking such a weapon myself, I tried my best to move noisily. We found a stream, flowing out of a shallow depression, where cold, clear water bubbled up from the earth. Bushes filled the clearing, reaching for the sunlight beyond the shade of an overhanging pine tree. I thought of the Lost Woods of Hyrule, where mischievous creatures ran amok. We followed the stream downhill until it emptied into a muddy morass. All along the swamp’s margins, the bushes were dying, and lifeless tree trunks sat half-submerged in the centre. The air was filled with the smell of rotten eggs and, along the margins, holes bubbled with steam and hot, grey mud. 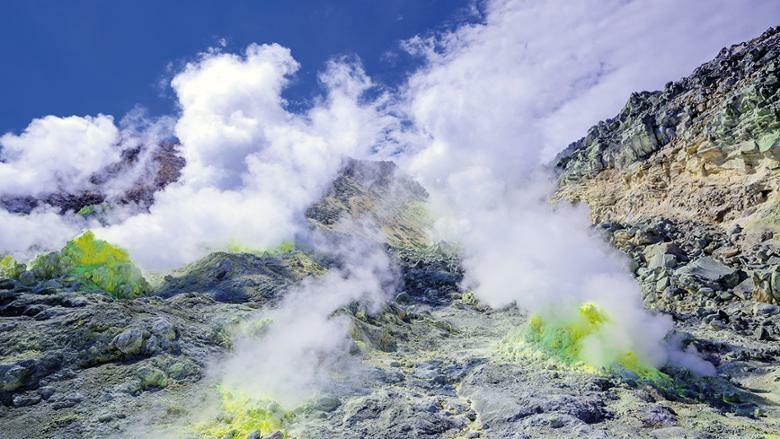 ‘It’s an acidic hot pool,’ said Kikuo, ‘This was once a normal patch of forest, until a thermal vent appeared. The hot water comes up from the earth and brings sulphur dioxide with it, which is why you get the rotten-egg smell.’ She took a carton of eggs and a small net from her bag, then looped the net over the end of a long stick. She placed the eggs in the net, walked over to a bubbling hole the size of a large saucepan, and let the net dangle inside. Five minutes later, I lifted it out and cracked an egg against a nearby rock. It was perfectly boiled. 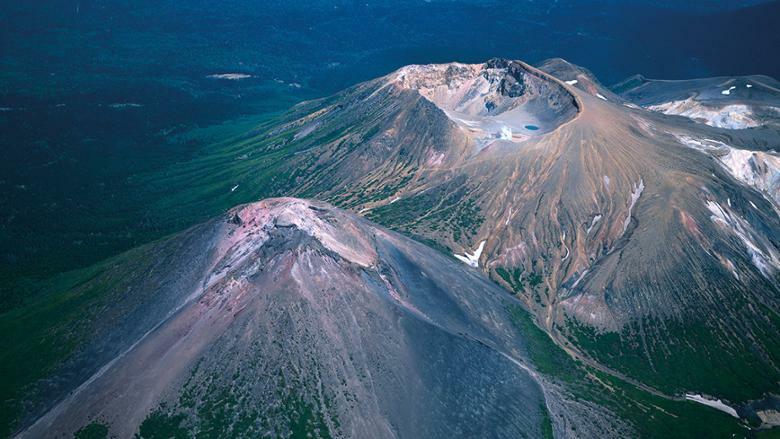 Mount Iwo, nearby, shows what can happen when the vents keep growing. From the visitor centre car park, a path wound indulgently through a spruce forest. The unnecessary turns encouraged me to linger on the path and take in my surroundings, noticing the way the light fell through the trees, or how the moss on the bark only faced in one direction. This sort of attention to detail is typical of Japanese nature experiences, and I love it. Over the course of about 100 yards, the trees got smaller until they were the size of bushes, then they suddenly stopped, revealing Mt Iwo. The mountain looked like it had been cleaved with a giant axe. Fluorescent yellow fumaroles belched steam from the crack, the colour coming from raw sulphur being deposited by the vapour. The last few hundred yards of ground in front of the mountain were completely bare, and covered with grey ash from previous eruptions. Dead pine trees lay bleached in the sun. They don’t decay, because not even bacteria can survive in the acidic soil this close to the mountain. If ever I was going to see Hyrule’s Death Mountain, this was it. ‘Try picking up that rock,’ said Shinobu, pointing at a large boulder. I scoffed, but he insisted. So, I wrapped my arms around it, braced my back and, to my surprise, lifted it to chest height. When I dropped it, the ground echoed like a drum. ‘It’s full of holes!’ laughed Shinobu. ‘So it’s much lighter than you would expect. And the ground beneath your feet is hollow. When the mountain erupts, boulders like that are thrown out like bombs, and the magma flows out as lava. The upside to all this heat is the onsen, or natural hot springs, so beloved throughout Japan. On the shores of volcanic Lake Kussharo, I found an onsen that was completely open to the sky. The stones around the edge had been fashioned to allow safe entry, but the bottom was the same natural gravel as the floor of the lake. Next to the onsen was a small shower and changing area, and lolling in the hot water, with a long cool one in hand and the Milky Way overhead, was the perfect therapy for weary legs. 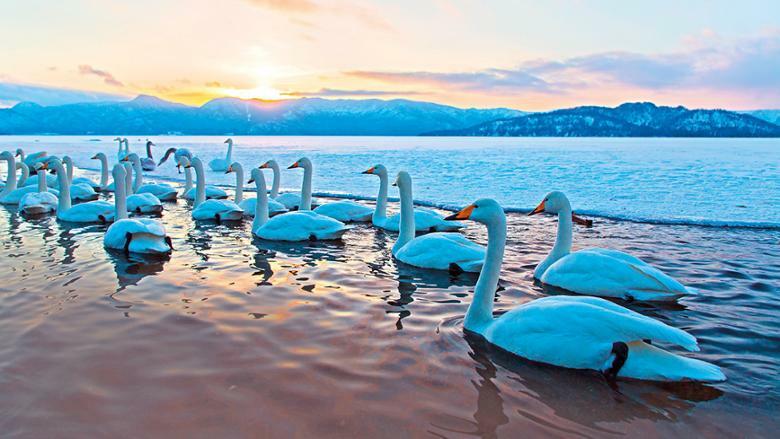 All that hot water flowing into Lake Kussharo makes it ideal for wild swimming, and the mellow, winding Kushiro River that leads from it is wonderful for canoeing. As the river approaches the Pacific, it enters a vast marshland that could be mistaken for the African savannah, except for the pyramidal silhouette of volcanoes on the horizon. There is nowhere else like it in Japan, and as we quietly ploughed on in our canoe, white-tailed eagles, ospreys, mink and dragonflies slipped through the air and water around us. 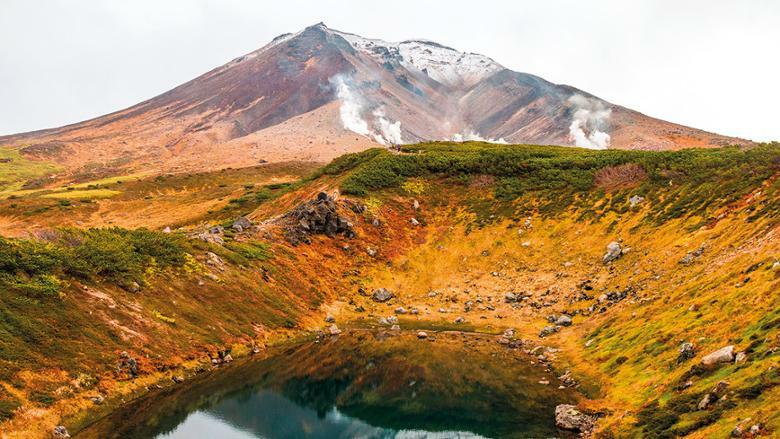 The next morning, I headed to Asahidake, Hokkaido’s highest mountain, and took the cable car up to the ranger’s hut. There was a lovely 30-minute stroll to some thermal vents, but the peak remained stubbornly shrouded in fog, and I headed back down, willing the sun to burn through the cloud. 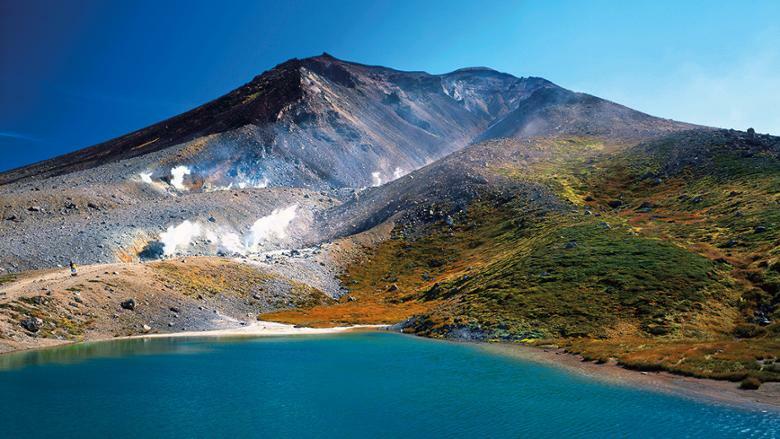 A walk around the mountain base was a worthy substitute; 30,000 years ago, the Daisetsuzan volcanoes covered central Hokkaido with ash, creating a soft rock that was eroded by the Ishikari River. The gorge that it left behind is a true marvel and, in autumn, when I was there, it was a rainbow of red cedars, orange mountain ash, yellow maple and green bamboo, with waterfalls streaming down its sides to the river. A cafe served the local speciality of soba (thin buckwheat noodles) with miso soup, and as I slurped it down, the sun finally started to break through. We jumped in the car to head for one last special sight: the Lake Mashu Third Observatory. From the roof of the observatory’s cafe, I looked down onto a bright blue, circular lake, with steep walls leading up to a sharp rim. It was a caldera, the empty magma chamber of an ancient volcano that had collapsed after erupting, and then filled with water. One corner of the crater rim had started to encroach on the lake, where a new volcano had formed. 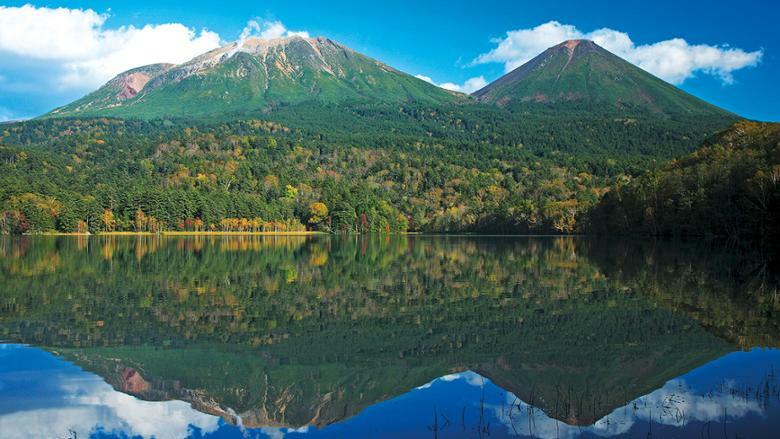 I turned around, and there, just three ridge lines away, was Mount Oakan, with Mount Meakan behind it. Both looked purple-grey, with a forest of autumnal colours and green paddy fields in front of them. White and grey clouds hung about the peaks, stretching in a straight line. Those mountains on the horizon were strangely familiar. Their perfect, geometrical shapes, smeared by the blue haze of distance, looked like they belonged to another world, one that I wanted to wander and explore. solving puzzles and meetings strangers. A warm breeze sprung up as I plugged in my headphones and pressed play on the Zelda soundtrack. On my phone’s screen was an image from the newest game in the series, showing a landscape that looked almost identical to the one that lay before me. I had found Hyrule at last. 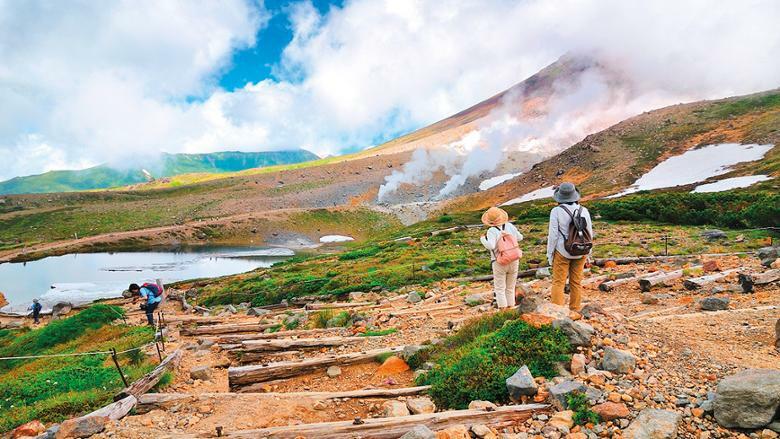 • Tsuruga Adventure Base (en.tsuruga-adventure.com) in Hokkaido runs an Invitation to the Mystical Forest experience, which costs about Dh240 (plus tax) for adults. 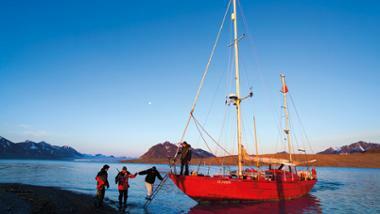 • Wondertrunk (wondertrunk.co) also offers glamping tours in Hokkaido. 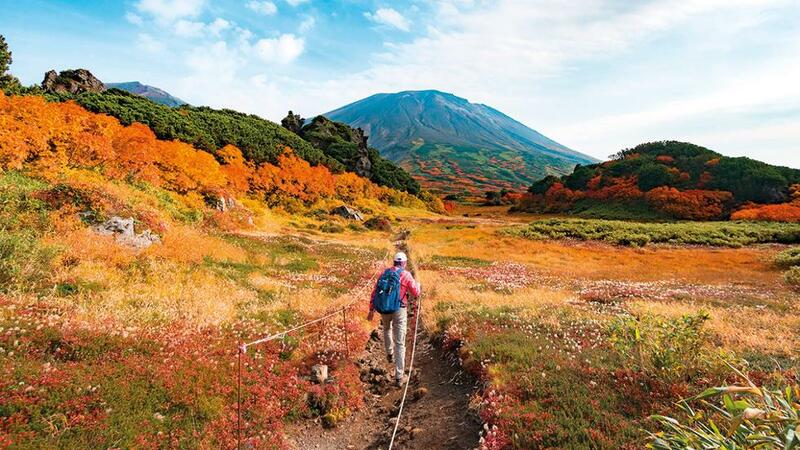 • For more information about travelling in Hokkaido, see best.visit-hokkaido.jp/nature. • For more on the Maeda Ippoen Forest Reserve, see ippoen.or.jp/about. • The official website for The Legend of Zelda is zelda.com.